It was also a good chance for me to check out Martha Stewart’s One-Bowl Chocolate Cake recipe. It was super easy (especially considering it came from Martha) and tasted wonderful. It will definitely be in my normal rotation from now on. I apologize for the sub-par photo quality – I’m hunting down my USB cord for my camera, so I took these with an older point and shoot. Preheat oven to 350 degrees. Place cupcake liners in each tin, or simply grease with cooking spray. Into the bowl of an electric mixer fitted with the paddle attachment, sift cocoa, flour, sugar, baking soda, baking powder, and salt. With the mixer on low, stir in eggs, 1 1/2 cups warm water, buttermilk, vegetable oil, and vanilla until smooth, about 3 minutes. Divide batter among prepared pans. Bake, rotating once, until tester inserted in center of cupcake comes out clean, 20 to 25 minutes, depending on the size of your cupcake tins. Let cupcakes cool in pans on a wire rack for 20 minutes, then remove from tins and allow to cool completely on wire rack. Makes about 24 cupcakes. 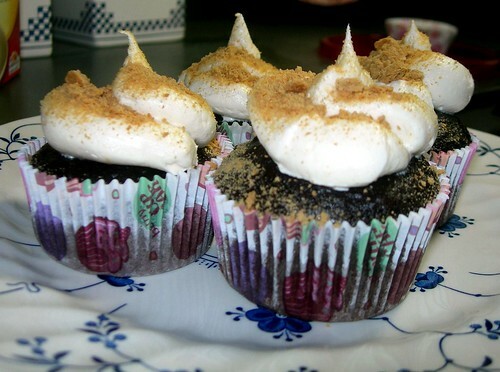 With an electric mixer, blend marshmallow and butter until creamed. Gradually add confectioner’s sugar until desired consistency and sweetness is reached. (I think I only used about 1 1/2 cups.) Add vanilla extract, and blend well. 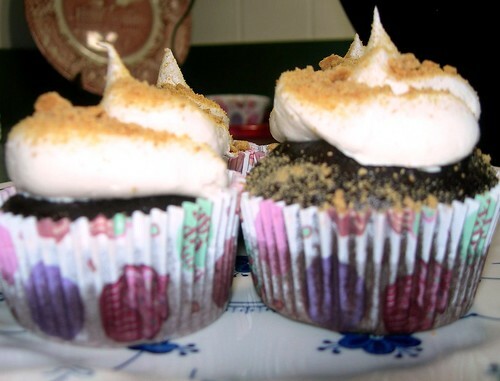 Ice your cupcakes with the marshmallow frosting. I used a ziplock back with a corner snipped off to pipe the icing on, which made it super easy. 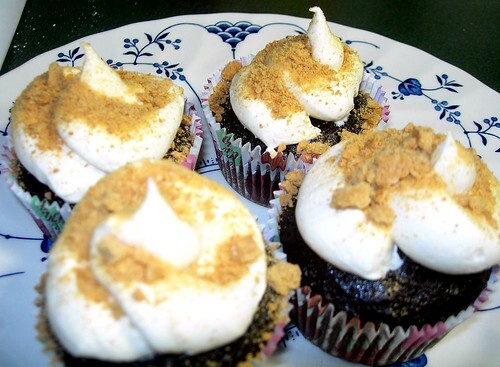 Sprinkle with graham cracker crumbs and garnish with a miniature chocolate bar.